W&P's Mason Jar Cocktail Shaker (left) and Home Essential's "Original Mason Cocktail Shaker." Just a year after it hit shelves, W&P Design's mason jar cocktail shaker hit $1 million in sales. This is typically a milestone for startups. But for Eric Prum and Joshua Williams, who invented the novelty cocktail shaker, the celebration has been short-lived. Their Mason Shaker -- a Ball Mason jar fitted with a custom lid that converts it into a cocktail shaker -- rolled out in West Elm stores in November 2012. Priced at $29.95, the initial order of thousands sold out in just three weeks. But they recently learned that a remarkably similar product -- the "Original Mason 16-Ounce Cocktail Shaker" -- was being sold at Bed, Bath & Beyond (BBBY). Produced by Home Essentials, it sold for $19.99. There were minor differences -- the price, the size, the fact that Prum and Williams' version used an original Ball Mason jar -- but the two products were virtually identical. W&P had filed a patent for their 32-ounce cocktail shaker in March 2012. But it takes an average of 29 months for a patent to be approved -- and businesses are left in limbo in the meantime. "We [now] find ourselves challenged by a large company that's making a knockoff product with impunity," said Prum. Related: Mason Jar cocktail shaker is a hit! On Dec. 14, 2013, W&P's attorney notified Home Essentials that it was potentially infringing on its product. "The response we got, through a letter, essentially told us that Home Essentials thought our product was unpatentable, and they'd continue to supply their shakers," said Prum. Prum said W&P also sent a letter to Bed, Bath & Beyond, informing the retailer about the dispute. Home Essentials did not return repeated requests for comment from CNNMoney. Bed, Bath & Beyond also did not respond to requests for comment. It's not the first time Home Essentials has been involved in an infringement dispute. In the last 10 years, the company has been a defendant in four copyright and trademark infringement lawsuits, all of which were settled, according to court documents. These types of patent infringement cases can be extraordinarily expensive for small businesses on the other end. "The average costs of infringement lawsuits can be upward of $1 million," said patent attorney Yuri Eliezer. "Most small startups can't afford it." Therefore, he said the disputes typically result in a settlement or the small business being acquired. Eliezer has seen both sides of the David v. Goliath battle, as he spent most of his career representing large corporate clients in patent filings. In 2013, he switched sides and co-founded Atlanta-based SmartUp, which helps inventors and startups navigate the patent-filing process. He said W&P's situation isn't uncommon. "Small businesses and entrepreneurs often take the right steps to protect their ideas, but big companies sometimes do the opposite," he said. "They won't check for patents because they figure they have the money if they have to fight a lawsuit." Prum said his company's sales haven't been hit, yet. But customers have been confusing the Home Essentials' shaker for his product. 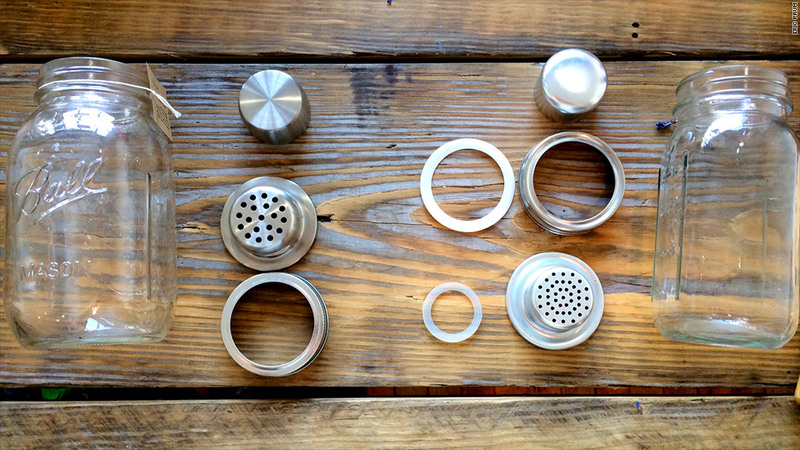 "They want replacement parts for the shaker or they're just complaining about it," said Prum. "Now that's my problem too. We have to write back telling them it's not ours." "Right now, there's no other recourse for us," he said. W&P can't pursue a patent infringement suit until its patent application is approved, which could take several more months. "We're just trying not to be distracted by this," said Prum. "We have 10 part-time employees and a product that's spawned a brand we're trying to grow."